A new version of TrueAncestor SELF Resigner by JjKkYu is available to download. 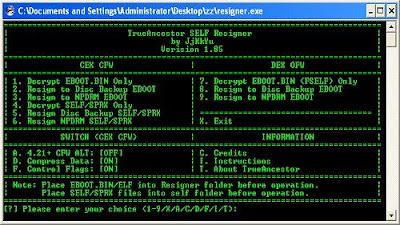 If you are unsure of what this tool is it is a PC Tool that allows you to extract, decrypt and resign EBOOT.bin for CFW 3.55. Feel free to check out the changelog and the download link provided below. - Turn on compress data switch as default. - Add decrypt SELF/SPRX option. - Add Klic Pool file in tool folder. - Fix bug in resigning npdrm self file.